This guide will give you the best chance of getting a high target kickstarter campaign funded, while also giving you techniques to take advantage of the long term SEO benefits kickstarter can give your business. A great way of creating a buzz about a new business is by crowdfunding. Crowdfunding gives you a busy platform to show the world what a cool business plan you have come up with. If used correctly you can tap into the 17 million monthly visits kickstarter has to bring an audience to your business. Crowdfunding raised $5.1bn in 2013 so you can see this as a useful cash investment if you hit your target, or just a great way of getting your business noticed if you don’t. Crowdfunding also gives an excellent excuse to give a press release. The press loves wacky crowdfunding ideas – the public loves wacky crowdfunding ideas. Who doesn’t. A lucky person managed to make $55,000 dollars by kickstarting a mashed potato party. The press had a field day. With the right idea, pitched to the right market, the inbound links generated from a well thought out kickstarter campaign with a press release can really kickstart your business’ SEO. Whether or not you actually achieve funding, kickstarter can be used for an unconventional link building tactic by taking advantage of the psychology behind limited time offers. The description – is the most important consideration when you are starting out your kickstarter campaign. Make sure it is solid. Think about how you can present your view in best way that people will relate to it, and build links to it. Make you idea seem as cool as you can – kickstarter is largely for trendy types who want to be part of the latest cool idea. Theme your homepage around the kickstarter campaign. This will bring traffic to your homepage from people on kickstarter – and is important later. When your press release should get a lot of inbound links. If your goal is to get a following rather than necessarily get funded you want to set your funding target to be fairly high – you will get more traffic and generate more business this way. You are less likely to get funded with £10,000 than £10 but if you set your target low and quickly hit it people will lose interest in what you have been doing. Think long term rather than short. With the right campaign in one month you can be swamped with clients – do you really need the funding? The other major bonus of setting a high target is if you hit it you have a lot of money to play with which you can use to further market the idea. This campaign generated 30x their original target. Think about how much publicity this must have got them. Build a video on YouTube – this has multiple advantages. A video will create a buzz around your YouTube channel, giving you subscribers, video SEO and an audience that you can build videos to market to in the future. It doesn’t have to be a hugely complicated video – you could just be talking while illustrating your idea with a whiteboard – but the video is vital and must be there. Crowdfunding campaigns with videos are far more likely to hit their target. Reward people for funding you. This is the hardest part to give advice on, but if you have a great niche idea should be the easiest for you to think up. Popular rewards are dedicating a product’s name to your largest funders, a thank you page on your website, or t-shirts. Another way people use kickstarter is as a sales platform. You can use kickstarter to sell a limited edition version of your product or a pre release version for your funders. Think outside the box and try and come up with things people will really want. That said if your idea is great it should fund itself. So how does this all translate into SEO? Google uses inbound links from reliable sources (among many other things) as a way of gauging the reliability of your website. 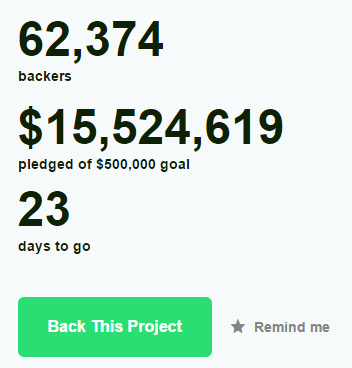 Kickstarter campaigns only exist for a limited time so they create a great buzz. People trip over themselves to say “look at this cool idea I found, lets make it real”. The trick is making this short term buzz give you long term benefits. We have already briefly covered the video SEO advantages of kickstarter. People see your video. If they like your idea they will subscribe to your channel. It is a good idea to include a call to action in your video – “if you like my great idea subscribe to my channel to see what I come up with next”. Or “If you like my great idea fund it to make it a reality”. People are much more likely to do something if you tell them to, it puts the idea in their head and they think oh that’s easy I might as well do it. When people subscribe to your channel you essentially have a lifetime follower (as long as you don’t annoy them or they stop using their YouTube account). You can then feed your subscribers a mix of interesting or funny videos and more sales focused videos. The goal is to keep your product or service in their mind so they eventually decide they want to make a purchase. You only need to softly sell if you have a large audience. Here’s a great video on how to make your own as good as possible. As covered earlier dedicate your homepage to your kickstarter campaign for it’s duration. Have plenty of links to other content on your page. People will visit your website from kickstarter and if it gives more information and they are interested in the campaign they will talk about what you are doing and link to your homepage. After your campaign has ran it’s course you can change your homepage to anything you like but the links will still be there. You want to make your social media very visible on your website. If people follow you from your crowdfunding campaign you have another medium to softly sell through which will give you benefits long after your crowdfunding campaign is finished. If you are close to your target but your campaign is running out of time you might consider a paid social media campaign to get the last few $s. The press release is the most important stage in getting a high target kickstarter campaign funded. The ability for you to pitch your idea to the press (or other online blogs) will dictate how likely you are to get funded and also the long term SEO benefits to your website. Find blogs, magazines or even newspapers with a similar theme to your website. These publications will be the most likely to pick up on your idea and give you access to their reader base. Their reader base will be more likely to fund you and write about what you are doing because they are already interested in your field. BUT most importantly a link from a website with a similar theme to your own is much more powerful – seen as much more reliable – than just any old link. We covered earlier the psychology of why people love kickstarter and the same is true for the press. It is surprisingly easy to do a press release. Find authors in your chosen publications who are particularly focused on your field, or who have ideally done stories on kickstarter before. Follow their social media and send them a message presenting your idea and offering them an interview. You have already done half of their job for them and because your idea fits well in their publication they are likely to say yes. Have a mix of small niche websites and much larger sites. Vice love their crowdfunding stories. After a few press releases other publications should pick up on what you have been doing and then watch as the money rolls in. When you are giving interviews about your idea include strategic links to other pieces of content you have which you want to rank well on Google. If people are willing to give you an interview they should also be willing to link to your kickstarter project and your homepage. As other websites quote the interviews you have given watch the pages which you have given links to rank higher and higher on Google as people share them around the internet. This all sounds very simple. It isn’t hard as long as you have a great idea to kickstart. Your idea doesn’t have to be new, you can present it as a small twist on what you are already selling. Remember when you are trying to linkbuild the the money isn’t the goal, it is an added bonus if you hit your target. What you really want is the traffic, audience and exposure.